Apologetics Press - God Gave Us Goose Bumps! You’ve experienced goose bumps. When you have gotten cold, you’ve noticed bumps rise on your arms (or even your legs, neck, and other areas of the skin that have hair). Evolutionists continue to claim that goose bumps are leftover from our evolutionary ancestors. That’s silly. Eve rything about your body was designed by God. The different parts of your body serve important purposes as God intended. Goose bumps get their name from bumps that can be seen on a goose when its feathers are plucked. Goose bumps happen when tiny muscles at the base of each hair follicle contract and force the hair to stand up. These muscles are called erector pili [ih-RECK-ter PIE-lie] muscles. Isn’t it amazing that this happens without you thinking about it? God made them to work whether you think about them or not. But why do we get goose bumps? Consider two reasons. 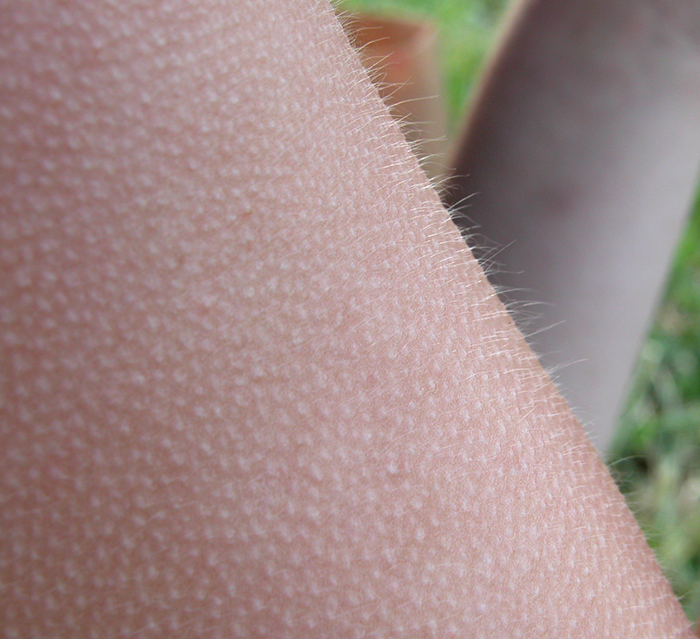 First, goose bumps occur when we get cold. The muscles that contract cause the skin to “bunch up,” forming little bumps that cause your hairs to stand up straight. In addition to the muscle tension, the rising hair forms a layer that traps air between the hairs and skin, creating insulation and warmth. This amazing way for the body to preserve its own heat, reducing heat loss, had to have been designed by God. Goosebumps are not evolutionary leftovers! Second, we also get goose bumps when we get hot, or face extreme heat. God made our bodies to sweat as part of an efficient cooling system. As perspiration accumulates on our skin, it naturally evaporates. As the sweat evaporates, it cools down the skin surface. But this process causes a dramatic temperature difference. So the body responds to the “chill” of the sweat evaporation by engaging the “goosebump response” when we get too chilled. Notice that goose bumps serve very important purposes for people. Goose bumps were designed by God. They most certainly are not unused, unnecessary “vestigial organs” left over from evolution!